Brakes are the most important piece of safety equipment on your car. Therefore, it is important that you make sure they are kept in good working condition. In your car's manual it is indicated when the car needs a service, during which your mechanic will do a full safety check on your brakes. Faulty brakes are only usually detected in the servicing of your vehicle or when there is an accident. You don’t always know whether your brakes are worn or ineffective just by driving normally, in the case of an emergency stop the strain put on your brakes can cause them to fail if they are worn. If the car is pulling to one side when braking, this indicates that the pads may be wearing unevenly. They make noise when turning, suggesting that the caliper is not fully fitted onto the brake disc. When you brake, there is a grinding noise. This indicates that either pads or discs are worn out. It can be rust, so if it's only when you start driving, and then it disappears, this suggests it is probably rust and therefore nothing to worry about. If the brake fluid is missing, the brake pedal often becomes spongy and unresponsive. This can also happen when air has got into the system. When there is too little fluid, the brake pedal goes all the way down and hardly brakes at all. If your service is coming up, and have a long journey planned, such as going away, it may be a good idea to get your vehicle checked by a mechanic beforehand. They will check the full brake system; brake fluid, brake discs, brake pads and brake shoes. If they are worn or soiled, they will be replaced or cleaned. Make sure you get the brakes checked regularly. At Autobutler we get you 3 quotes from local garages. You communicate directly with the garages, and choose the deal you think is best. Once you have found a great price you can book online at the selected garage. After the garage visit, you can review the garage, so that other car owners can use your experience to choose the right garage for them. If you drive optimally, you can reduce the wear and tear on your brakes, thus prolonging their life. At the same time, you can save fuel, so it's a win-win situation. The more you use the clutch to engine brake, the more you can avoid using the foot brakes, thus reducing wear and tear on them. Engine braking means you release the accelerator and lowering the gears takes speed off without braking. It is not as fast as with the brakes, but easier on your car. Avoid prolonged braking, for example downhill or curves, use lower gears. Generally brakes will need to be replaced throughout the lifetime of your car. There are two different kinds of brakes used for cars, drum brakes and disc brakes. Traditionally, the front brakes are disc brakes and the rear brakes are drum brakes. The rear brake is also used for the handbrake. More and more models use disc brakes for both front and rear, where the rear brakes can be either disc or drum. The front are disc brakes as they are most effective, when braking heavily the front brakes will take 60% of the impact, which means they need to be stronger than rear brakes. Disc brakes work when the calliper clamps the brake pads onto the brake disc, slowing the vehicle down. 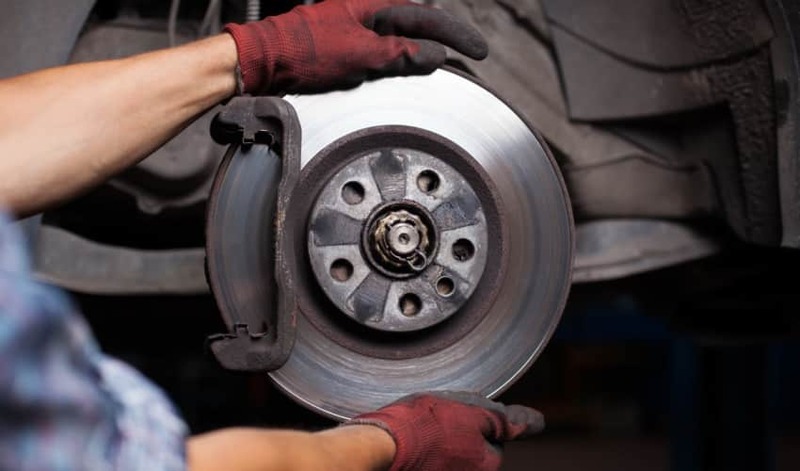 As brakes are by far the most important safety feature of your car, we recommend that a professional mechanic performs any checks and repairs. When it is time to change your brakes, it is common to change the brake drums/discs as well as the pads. The drum brake consists of a metal drum, a leading shoe and a trailing shoe whereas disc brakes contain a brake disc and two pads positioned either side within the brake calliper. When using brake drums, the shoes get pushed onto the inner surface of the drum, which then causes friction and stops the wheels from turning. They are not quite as effective as disc brakes, which gets pressure from both sides, where the drum brake only get pressure on the inside. Slowing down generates heat, and as it is inside the drum where the brake shoes operate, there will often be grooves for ventilation. At the same time, brake dust is released which has to be removed from time to time and may cause the drum brake to become defective. Therefore, regular servicing of the brakes is very important. The brakes are designed to assist the driver to slow down, so there should be no need to press so hard on the brake pedal. Petrol cars use the vacuum servo in the intake manifold, while the diesel engines often use electric brake booster. You should be aware that the brake servo/booster does not work when the engine is off. It is rarely necessary to change the brake servo, but when it happens, you can get three quotes from local garages with Autobutler. ABS (Anti-lock Braking System) ensures that the brakes do not lock and cause the car to skid. It works by a sensor in the wheel hub that constantly sends data to a mini computer which controls the pressure of the brake fluid for each wheel. This way it can quickly be corrected if a wheel does not rotate, by lowering the pressure, the wheel is free to rotate. It gives some unrest in the brake pedal when it happens, but is necessary. ABS brakes are checked at regular service, and worn parts changed by your garage as needed. What is a Brake Bleeding Kit?